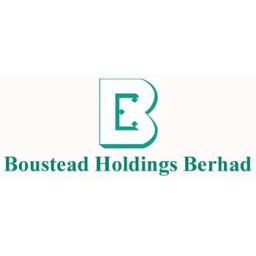 Number of Shares: 2026 M.
Boustead Holdings Berhad, an investment holding company, is engaged in diversified business in Malaysia. The Plantation division cultivates of oil palms in Malaysia, as well as involves in planting and processing oil palm and rubber; and forestry and oil bulking installations businesses. The Heavy Industries division is engaged in shipbuilding; marine engineering, oil and gas, offshore fabrication, and fabrication of steel structures and platforms; and ship repair businesses. This division also provides marketing and related services for the maritime defense industry, as well as supplies and maintains weapons and guns. The Property division invests in and develops commercial and residential properties, as well as operates hotels. The Finance and Investment division offers commercial banking services, including credit cards, personal loans, mortgages, and deposit-taking services; and investment banking services businesses consists of money broking, fund managing, and underwriting general and life insurance products. The Trading division is engaged in warehousing and distributing moving consumer products; providing general insurance services; and distribution of engineering products, including wheel loaders, transmission chains, weighbridges and weighing equipment, hydraulic dock levelers, and other materials handling equipment. The Manufacturing and Services division is engaged in manufacturing and marketing architectural and protective coatings. It also produces cellulose fiber cement boards for a range of ceiling and cladding applications; produces and markets roofing and cladding sheets; and manufactures and installs steel roof truss systems for commercial, residential, and industrial buildings. In addition, this division provides various travels and tour related services. Boustead Holdings is based in Kuala Lumpur, Malaysia.